Popular conservative radio host Hugh Hewitt – who tied Donald Trump to the whipping post recently over Middle East affairs, then folded like origami when he was criticized for it – took to Politico yesterday to do the crystal ball thing on presidential odds. 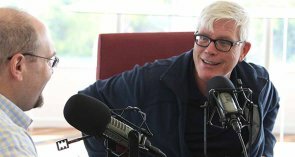 Hugh Hewitt—who (in)famously challenged Donald Trump’s iffy knowledge of world affairs in a headline-grabbing interview with the front-runnerthinks Trump has just a 25 percent chance of winning the GOP nomination. He gives Trump about the same odds as cash-rich, poll-poor Jeb Bush. That leaves a 50 percent chance of a who-the-hell-knows winner . . . But still leaves Trump top-of-the-heap. Not to get technical about it. Regardless, Hewitt also said this . . . This entry was posted in Uncategorized and tagged @realdonaldtrump, Donald Trump, Dustup 2016, GOP Hair Apparent, Hugh Hewitt, Media Matters for America, Middle East, Real Clear Politics, Scott Walker drops out, Slate. Bookmark the permalink.